In the realm of rugged outdoor kitchenware, nothing comes close to the reliability of Glacier Stainless™ premium 18/8 stainless steel construction. With a brilliant, rust-proof finish and the strength that only steel can provide, Glacier Stainless is the material of choice for decades of use. In the realm of rugged outdoor kitchenware, nothing comes close to the reliability of Glacier Stainless™ premium 18/8 stainless steel construction. With a brilliant, rust-proof finish and the strength that only steel can provide, Glacier Stainless is the material of choice for decades of use. 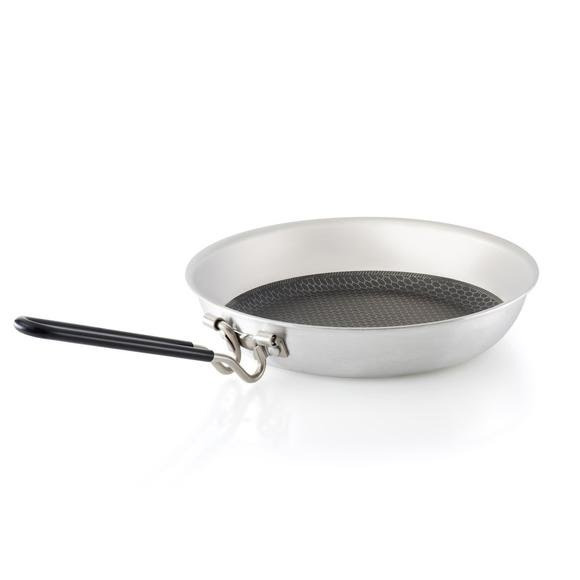 And with a heavy-gauge, clad aluminum core, these frypans from GSI Outdoors remain lightweight and quick heating over any heat source, just like the finest gourmet pans. And the laser-etched nonstick surface offers excellent food release and easy cleanup. Of course, our premium 304 (18/8) stainless steel construction is still non-reactive, free of BPA, PFOA and Phthalates - what could be better than that?